West Hartford Public Schools continues to see steady changes in our racial, ethnic and socio-economic demographics and embraces the richness that diversity brings. The Equity and Diversity Council (EDC) currently exists as a staff advisory committee that seeks to promote equity, advance diversity, and foster inclusiveness, acceptance, mutual respect and support, civility and non-discrimination across all areas of our district’s programs and services. The work of the EDC is aligned with the WHPS’ mission and vision for Clear Paths. Bright Futures. No Limits. The purpose of the Equity and Diversity Council (EDC) is to support and sustain a diverse educational community that is inclusive and equitable by examining, developing, and improving systemic practices, programs, and policies. Roszena Haskins, Director of Continuing Education and Diversity Advancement at 860-561-6900 or roszena_haskins@whps.org. All EDC meetings will take place on Thursdays from 3:45 pm - 5:00 pm in Room 400 of Town Hall located at 50 South Main Street. See meeting dates below (Please bring your parking ticket inside to be validated). *Dates when Subcommittees will meet in assigned Town Hall locations. On other dates, the Core Membership will meet, but ALL are welcome to attend. Next Meeting: EDC Subcommitees will meet on Thursday, March 21st at 3:45pm in designated Town Hall rooms. All are invited to attend. Each year the event that pays tribute to Dr. King’s ideals and vision grows more popular and inspiring. The event draws nearly 400 people each year. The celebration is free and open to people of all ages. The 4th annual conference on Dismantling Systemic Racism-Friday, April 26th, 8:30 am - 3:30 pm. Sponsored by the State Education Resource Center (SERC) in collaboration with the SERC Foundation, focuses on ways to support, promote, and develop racial equity in education. WHPS and CCSU Future Educators of Diversity and Project Blue Devil Direct Partnership Rollout Ceremony. Everyone Included Part 2: LGBTQIA+ Wednesday, October 24 , 9:30 am - 4:30 pm- Wallingford Public Library, Libraries are a place where children’s imaginations take flight. Books, programming, and activities launch possibility into motion. Children are free to dream big dreams of who they can become in the world. That magic happens in part because children seem themselves reflected in the images and stories around them. But what about the LGBTQ youth and families your library serves? Do they see themselves in your stories and on your shelves? In addition to covering the basics (terms and definitions), this 2 hour workshop will explore teaching tips and strategies for inclusivity, offer participants the opportunity to share ideas for increasing awareness and empathy, and provide a short list of some of the best resources in books and videos. "Dawnland" Film Screening Showing Mon. 10/8, 4pm Noah Webster House - 227 South Main Street, West Hartford -The film casts a spotlight on a state welfare policy in Maine that forcibly removed Native children from their families and placed them in white foster homes with the intent of erasing Native identity and heritage. 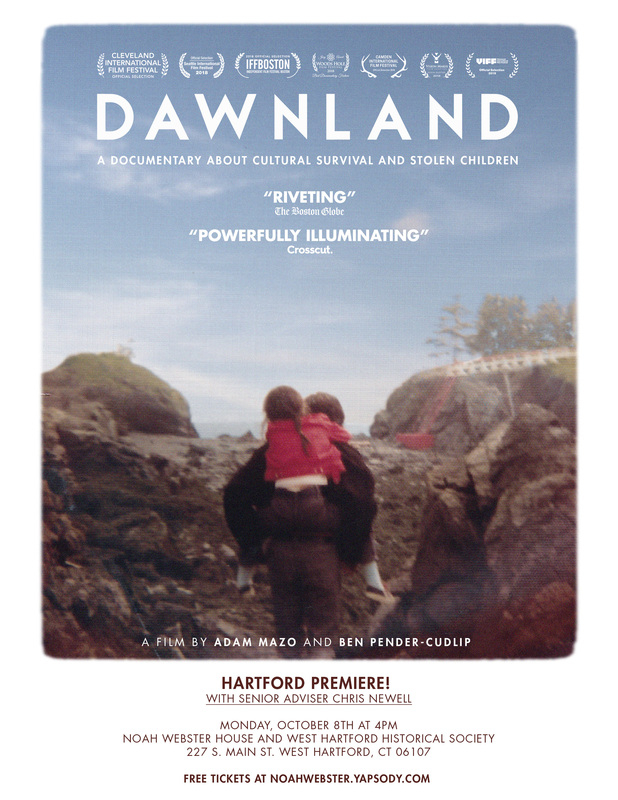 Over the course of two years, Dawnland filmmakers traveled to the Maliseet, Micmac, Passamaquoddy, and Penobscot tribal communities in eastern Maine to gather information and testimonies from survivors, family members, and state welfare workers. The film draws from the first state-sanctioned truth and reconciliation commission in the U.S., established to bear witness to oppressive state policies toward Native peoples in Maine and to chart a new course for state and tribal relations. Dave Stevens, Motivational Speaker, Tue Oct. 9, 7pm, Norfeldt. Dave Stevens was born without legs. He was a 3-sport athlete in high school and college, played Minor League Baseball and won 7 National Sports Emmy Awards while at ESPN. Dave shares his amazing story about his he turned his disability into his ability while overcoming adversity. His words will move you. His life will inspire you. Children's March Showing-Sun. 9/23, 2pm - 4pm Auditorium of Charter Oak International School- Join West Hartford friends and neighbors as we learn the story of how the children of Birmingham, Alabama fought segregation in 1963 through nonviolent protest and were catalysts for positive change that impacted our entire nation. Stay for the youth led panel discussion about activism in our schools and community, featuring West Hartford students. Witness Stones Project and Installation Ceremony- Wed. 9/26, 9:30 am - 11:15 am- The ceremony will take place at First Church 12 S Main St, West Hartford, and the installation will take place at 34 N Main St, West Hartford - Acknowledging the Enslaved. Remembering George and Jude Remembering the Goodmans and the Sedgwicks Come to the ceremony and hear Conard students tell the stories of these men who were enslaved Witness the stones placed in the Old Center Cemetery. Friday, May 18 at 6pm- Charter Oak International Academy Ampitheater. Please see flyer for more great details. Transgender? Bi-gender? Pan-Gender, Non-binary? What? Tuesday, January 9, 2018 7:00 p.m. – 8:30 p.m. Noah Webster Library, Meeting Room 20 South Main Street, West Hartford, (860) 561-6980 Jane Breen, the West Hartford Libraries’ Children and Families Outreach Coordinator, will share many books, offer ideas for extended book activities, and facilitate discussion among participants about successes and challenges in tackling these topics with young children. To register, e-mail register greatby8@gmail.com. West Hartford to Celebrate Life of Dr. Martin Luther King, Jr.
It’s time to talk — and listen — about racial injustice. If you’re white, chances are you’ve been taught not to talk about race. If you’re a person of color, you may be wondering what it is that white colleagues aren’t (yet!) understanding. Join Debby Irving, author of Waking up White, and Finding Myself in the Story of Race, as she shares how her own white-skewed belief system enabled her to affirm harmful racial patterns for decades rather than question and dismantle them. Together, we will explore white privilege and our own, often subconscious, roles in perpetuating racism at the individual, interpersonal, institutional and cultural levels. The day will include time for reflection, dialog, and Q&A. Lunch provided, space is limited. MUST Register to attend.